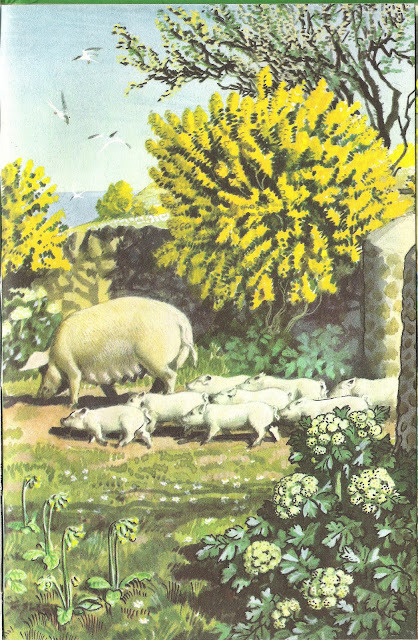 In Spring picture 17, I suspect the image of a sow and her piglets might have been a romanticised image of pig farming, even for the period of 1959-1961 when it was painted. I’m not planning to say any more here about pig farming and how it has changed since then, as this looks more like a pet pig! The other features of the picture are three plant species, gorse, Alexanders and cowslips all in flower and, in the background, some terns over the sea. Gorse (Latin name: Ulex europaeus), is the large bush with bright yellow flowers in the background of the scene. It is a thorny shrub native to most of Britain and Ireland, although it is an introduced species on the Outer Hebrides, Shetland and Orkney (and the Isle of Man). It generally grows on poorer, slightly acidic soils, and occurs widely in under-grazed pasture land, in coastal habitats, waste ground and along roads and railways. The 2002 New Atlas of the British and Irish Flora reports that gorse has increased its distribution in Britain since 1962, suggesting that this is due to an increase in disturbed (“ruderal”) habitats and the reduction of grazing pressure on lowland heaths and coastal cliff tops since the 1930s. Richard Mabey, in his “Flora Britannica”, describes gorse as “one of the great signature plants of commonland and rough open space, places where lovers can meet, walk freely and lose themselves, if need be, in its dense thickets.” The old romantic! I love the smell of gorse in flower. On sunny, hot days, the overpowering smell of coconut from gorse flowers (also said by some to smell like vanilla) can be amazing! I was privileged to be able to visit an army training area on a coastal dune and heath system near Dundee last week (for a meeting), where the conditions on the coastal heathlands (formerly but no longer extensively grazed) seem to be perfect for gorse – the whole area is aflame with bright yellow gorse bushes. The large umbrella shaped flowers in the bottom right of the picture belong to Alexanders (Smyrnium olusatrum), an unusually-named but impressive perennial herb species introduced to Britain during Roman times, and reported in Flora Britannica as being widely cultivated (in monastery and cottage gardens) until it was displaced by celery in the early 18th century. It has a predominantly coastal distribution in Britain (so is very appropriate for inclusion here in this picture) and is often the first fresh foliage of the year appearing in coastal hedgerows. The new Atlas reports that its distribution has changed little since the 1962 original Atlas. It only occurs sporadically in Scotland on the southwest and eastern coasts. Personally, I have only ever seen it on the Pembrokeshire Coastal Path; I think it looks like a wild carrot on steroids. The third plant in the picture is the cowslips, flowering in the front centre. The cowslip (Primula veris) is a distinctive feature of well-drained herb-rich grasslands. The cowslip was clearly a popular species in Britain, considering the number of local and vernacular names that it has been given – how about culverkeys, hey flower, heggles, bunch of keys (all quoted in Flora Britannica)? It is not widely distributed in Scotland, being restricted as a native species to southern and eastern Scotland. Although the New Atlas indicates that the distribution of clowslips hasn’t changed much since the 1962 Atlas, it is reported in the New Atlas that it suffered a marked decline between 1930 and 1980 due to the intensification of agricultural practices, in particular ploughing up or agricultural improvement of grasslands , and the increase in use of herbicides. Since the 1990s, however, the fortunes of the cowslip seem to have improved, particularly on unsprayed roadside verges, village greens and other public greenspaces, and in new road schemes, where it is often included as a component of the wild-seed mixtures which have become increasingly popular as part of planting schemes. Were the New Atlas to be re-printed in the next few years, it is possible that cowslips would be recorded much more widely in Scotland as a result of such plantings and re-seedings. The only bird species in the picture, and the last feature to be discussed, is the flock of terns “above the cliff beyond the meadow”, which have “just arrived after their migration flight”. The sound of calling terns is another sound of impending summer to me. I used to hear terns every day in Summer from our garden above the bay where I grew up and the sound never fails to tickle those old memories. There are five species of terns that breed in Britain and the text doesn’t make clear which these are, so I am going to assume that they are Arctic Terns (Sterna paradisaea), the commonest species found in Scotland (although the Common Tern (Sterna hirunda) is commoner in southern Britain). Arctic and Common Terns actually look pretty identical bar one or two minor details of leg and beak colour and are sometimes described as “Comic” Terns (COMmon + arctIC – get it?) if it isn’t clear which they are. My much-loved old AA Book of Birds describes terns thus: their “graceful flight makes then the swallows of the sea” (indeed, the “hirunda” part of the Common Tern’s Latin name refers to the Latin word for “Swallow”). It also describes what is surely the most-well known thing about Arctic Terns, its remarkable annual global migration, as follows: “Twice yearly, the Arctic tern sets out on an amazing journey which carries it from one end of the globe to the other. It nests in Britain northwards to the Arctic, and winters 10,000 miles away in Antarctic seas”, sometimes right to the edge of the Antarctic icepack. It has been said that this bird enjoys more hours of daylight than any other living creature as, except on migration, it spends its entire life at high latitudes in both the northern and southern hemispheres. The Queen thinks everywhere smells of fresh paint, and the Arctic tern probably thinks that there is only Summer! Where I grew up in the 1970s on the East Lothian coast there was a considerable tern colony on a shingle spit that, occasionally, hosted nesting by all five British tern species (the others are the Little, Roseate and Sandwich Terns). But sadly, the Arctic Tern, although its range has not changed much, has suffered serious population declines in Britain (and elsewhere in northern Europe) in recent decades. Unfortunately, my reliable source of information (and graphs!) on trends, the website of the British Trust for Ornithology doesn’t have any on terns (I don’t know why). In Scotland, the decline has been most severe for Arctic Tern colonies on Shetland, linked to the failure in recruitment of sand-eels, the main fish species used to feed tern chicks. In the period 1981-1987, the collapse of the sand-eel stock was followed by a decline in successful production of Arctic Tern chicks, as shown by this report produced by the Marine Laboratory Aberdeen. Although there has been a decline long-term, I just can’t find anywhere readily, what the current status of the Arctic tern (or the other other four tern species) is – come on, BTO! Richard Maybey's lovers need to be careful where they lie down among the gorse - a bit prickly! On cowslips - Edinburgh City Bypass has a good show along its verges - as do the urban drainage areas in the Dunfermline Eastern Expansion. Many thanks for that, Anon! I saw the Edinburgh by-pass cowslips at the weekend - beautiful dispaly indeed.